Kevään tauko erityinen, 25. maaliskuuta - 13. huhtikuuta, ota yhteyttä hinnat, voittaa chill! 3 sviittiä, joissa on en-suite-pää, salonki, takka ja tilava ohjaamo. Alexis3 on Leopard 46 katamaraani, jonka omistaa Bambi ja Geoff Alexander, jotka tarjoavat lämpimän vastaanoton kaikille heidän vierailijoilleen. Tämä tarkoittaa yhteensä loma, et tee mitään muuta kuin rentoutua ja työtä rusketus! Kapteeni Geoff ja keittiömestari Bambi tekee kaiken työn ja kaikki aterioiden valmistukseen kaikki perustuu omaan erityisiä mieltymykset. Muista, että Bambi on upea kokki ja pilata makuhermoja! Illallinen on 3 kurssia. Sisältää 6 illallisia, 7 lounasta ja 7 aamiaista, Kapteenin Bar. Cocktaileja ovat erikoisuus! Sinulla on yksi illallinen rannalla omalla kustannuksellaan, jotta voit maistella paikallista makua. Tämä on paljon samaa kuin "All Inclusive" paitsi että otatte 3 lounasta ja 4 illallisia maihin omalla kustannuksellaan. Näin voit maistaa ja kokea ruokakulttuurista maissa se sitten Beach baareissa tai ravintoloissa kaikki ovat hauskoja. Tarjoamme kaikki aamiaiset, 4 lounaat ja 3 illallisia kyytiin Kelkkajengi. Kuten paljaalla veneellä, jolla on erittäin kokenut kapteeni ja emäntä kuin henkilökohtaiset saarten oppaat. Työjärjestykset alle viikon ovat pro mitoitettu. Alle viikon pituiset peruskirjat on arvioitu. 6 pax - 13300 dollaria. Me poimia St Thomas, tai BVI. Olemme tyytyväisiä viime hetken rahtaa! Viimeisimmistä Alexis3-tapahtumista löydät meidät Facebookissa osoitteessa: Yacht Alexis3. Tässä katamaraanissa on suuri peruskirja. Hänellä on kolme ylevää queen-size-hyttiä, joissa kaikissa on oma pää ja erillinen suihku sekä sähköinen wc. Kaikki mökit ovat ilmastoituja. Sedan on CD ja iPod-liitäntä, DVD ja TV sekä paljon pelejä. Hänen tarjous on 12-jalka kylkiluun kanssa moottorin tarpeeksi tehokas vetää sinut tai vieraasi lahden ympäri. Hänellä on myös 2 stand up -leikkauslautaa ja nuudelit ja kellukkeet vähemmän aktiivisille vieraille. Hän on tarpeeksi snorkkelit ja evät kaikille ja Jännitystä sukellusta ja surffausta voi aina järjestää. Jotkut parhaista sukellus maailman on BVI, joka sisältää hylky RMS Rhône, joka esillä elokuvassa "Deep". Tarjolla on laaja valikoima kävelee ja kansallispuistojen löytäjäänsä. on lukuisia houkutteleva ranta baareja ja ravintoloita ympäri saarta. Olipa etsimäsi täysin miehistöä, all inclusive loma gourmet-aterioita ja juomia edellyttäen, tai kapteeni Vain loma, jonka avulla voit ottaa keittiössä tai ruokailla rannalla, voimme taata Leopard tulee olemaan täydellinen valinta sinulle. Bambi on gourmet-kokki yli 20 vuoden kokemus. Vuonna all inclusive ja puolihoidon hän luo herkullisia päivittäin valikoita sinut yksityiskohtaisen etusija levyt jotka saamme ennen saapumista. Tule purje pois tänään !! Kolme kylpyhuoneet suihkulla ja sähköinen päät. Alexis3: lla on kaikki mitä tarvitset ja enemmän, Karibian merellä leikkipaikkana! Olipa etsimäsi täysin miehistöä, all inclusive loma gourmet-aterioita ja juomia edellyttäen, tai kapteeni Vain loma, jonka avulla voit ottaa keittiössä tai ruokailla rannalla, voimme taata Leopard tulee olemaan täydellinen valinta sinulle. Tule purje pois tänään !! This was our second catamaran charter in BVI, a little pricier than the first but absolutely worth it. Geoff and Bambi are a fantastic team, with two decades of experience on a series of boats, and they know BVI inside and out. You will love their South African accents. We did a half-board charter for a mix of Bambi's cooking and local restaurants. I recommend half-board to help the local economies a bit; they are still recovering from the 2017 hurricanes. We had good food onshore, but Bambi's cooking always beat the best restaurants (she used to run a catering business in Capetown). Geoff is a great captain, very laid back, happy to teach you anything about sailing. The boat's electronics are really impressive,and the boat is super comfortable--a Leopard 46 with easy-to-use toilets, quiet diesel engines and separate generator, cabin fans, paddleboards, even a/c if it gets too humid. We met up in Red Hook (east end of St Thomas, $15 taxi from the airport) did a big counter-clockwise circuit mostly motoring eastward out the Drake Passage, then sailing (sometimes with spinnaker!) out to Anegada and back via Jost van Dyke to Red Hook. Amazing, beautiful places every day. Thank you for your lovely review, you guys were without doubt a pleasure to have aboard. All of you took advantage of the beautiful ocean, you swam, snorkeled, paddle boarded and most of all you had fun, your laughter still rings in the rigging. We miss you! The most fantastic hosts, food, boat and scenery! The most fantastic hosts, food, boat and scenery! This is what you will get with a charter on Alexis3 hosted by Geoff and Bambi. My husband and I and our three girls, ages 16, 12 and 10 had the pleasure of spending a week exploring the BVI’s with them. Bambi works very hard to make sure she gets to know what food your family likes and dislikes before a charter. This is important when traveling with kids. She was able to come up with a delicious menu to please my husband and I as well as providing more simplified versions for our girls. The desserts are out of this world and she made my favorite cake for my birthday dinner. Geoff is a fantastic captain and taught us a little about sailing and has the most amazing stories to tell about their explorations throughout the world. He made the best cocktails and “fancy drinks” for the girls. 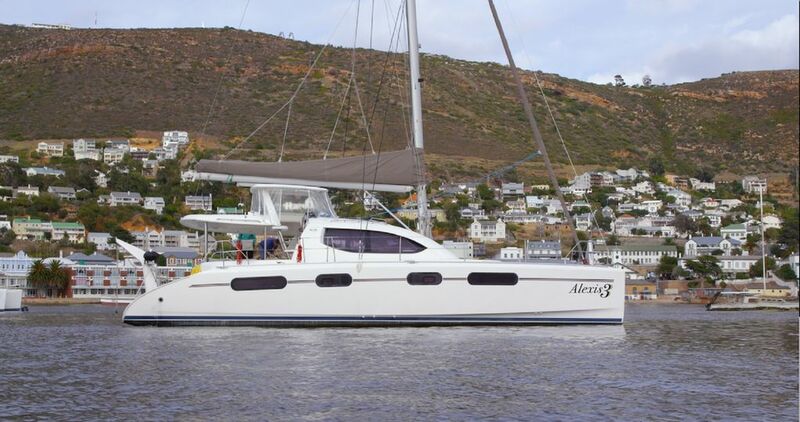 Alexis3 is a very comfortable catamaran that is well taken care of. The mattresses are nice and firm and there is plenty of room for our family to hang out. When we arrived they had cute little gifts for the girls on the beds which made them feel very special. Tip for travelers: pack very light! We had one backpack a person and that is it! We still ended up not wearing everything. Each suite has a couple of shelves and some larger storage under the bed. We enjoyed spending time while sailing around the trampoline area and evenings spent at aft dining area after dinner playing Mexican Train (our new favorite game). We loved visiting the islands and a cooler was packed for us with drinks and snacks to take to the beach. We had some amazing snorkeling experiences and Geoff knows exactly where to find them. Our last day Geoff took the girls on a tubing run behind the dinghy which was super fun! I can’t say enough about Geoff and Bambi and their graciousness. They provided us a vacation full of memories that we will never forget! Thank you! From the moment Geoff picked us up at the dock and Bambi greated us at the boat with a hug the trip was a dream! They were very accommodating and went out of their way to make sure our trip was exactly as we had hoped. We looked forward to every mouthwatering meal that Bambi cooked! The meals she prepared on a boat were incredible and she took care to accommodate likes and dislikes. Geoff's drink of the day was always welcome after a day of snorkeling, sunning and exploring beach bars all over the BVI. We enjoyed talking about their many journeys and marvelled at their world sailings. A trip we had thought would be a once in a lifetime bucket list trip we've decided it was just a drop in the bucket that we must now fill! We would travel with Geoff and Bambi every week if we could!!! care of us, indulging our every whim and anticipating our every need. And the food..expect nothing less than 5-star restaurant quality and you will not be disappointed. Every meal was nothing short of delicious and the desserts were off the charts! Geoff and Bambi were both so lovely and kind, it was a pleasure to be around them! The boat was immaculate and there was plenty of room for 6 people to spread out and have their own space if desired. It is a trip for all ages, you can do as much or as little as you want to, and there is something for everyone. The BVI's speak for themselves in terms of pristine beauty and serenity. Definitely a trip of a lifetime, but largely in part because of the hospitality of Geoff and Bambi. Run, don't walk to book this charter! Thank you so much for your wonderful review. We absolutely love to hear that you had such a great time. This is what makes what we do so rewarding, having super people like you and you family aboard having a great vacation. For my 60th birthday, I got to plan a trip for 3 couples and picked a catamaran trip to the BVI’s. Cool Running’s was my choice and what a great choice it was!! Geoff and Bambi were the perfect host and now friends! They took us to beautiful coves and excellent snorkeling areas. Suggested fun things to do on different islands, one of our favorites, was renting a car and driving around Anegada, exploring different beaches and bars. Bambi is a great chef and made use delicious meals. Geoff is an excellent captain and taught the guys how to sail some long sails, plus pours a mean cocktail!! We planned some theme nights while we were on our trip and they were a hit with all, including Geoff and Bambi. It made the evening’s fun to see what everyone would be wearing to dinner. The catamaran was a perfect size with plenty of room for all of us and our cabins were clean and comfortable. One of the most perfect evenings (and each evening was perfect) that will be in my memory for every, is being anchored between Necker and Eustatia Island, watching the sunset, on the front of the boat, while flocks of beautiful pink flamingos were flying overhead, drinking cocktails with my favorite people, and crew. We look forward to doing another trip with Geoff and Bambi soon! If you are considering Cool Runnings for your trip, you won’t be disappointed. Thank you so much for your great review. You guys with your sense of fun and adventure made it very easy for us to give you a vacation you appreciated. We do hope to see you all again. Our family loved our time on Cool Runnings with Theo and Augusta. They could not have been more attentive to our every need and their knowledge of the BVI's make our experience extra special. Thank you for the awesome time! Cruising Neitsytsaaret on kuin purjehdus läpi aarrearkku kauneutta. (Yksi, merirosvot jätti jälkeensä). Purjehdus unelma jatkuva lämmin kaupan tuulet, puhtaat vedet, neljäkymmentä täydellinen saaret, cays ja satoja upea kiinnityspisteet. Topsides on vehreät kukkulat ja vuoret, hohtavan valkoiset hiekkarannat, riehakas historia merirosvot, aarre ja rommi, ranta baareja, ravintoloita ja ostosmahdollisuuksia. Down Under on maailman huikea kauneus, koralliriutat ja ärsyttävä väri kaleidoskooppi trooppisia kaloja. Tämä kuulostaa turisti edistäminen, mutta siellä se on, kaikki totta, nyt kun on kuva, täydellinen, täydellinen paratiisi.